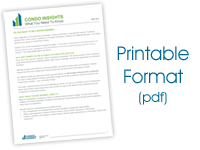 Learn more about the roles and responsibilities of your Condo Management Company and Board of Directors. The role of the Management Company is to administer your Condominium Corporation, in accordance with the Alberta Condominium Act and Amendments. It is their mandate, under restrictions of the Corporation budget, Board policies and Corporation By-Laws, to direct the activities pertaining to the maintenance of all common areas, prepare statutory documents and act as a liaison between the Board of Directors and individual Owners. A more important function of the Management Company is the development of a professional bond between the Board and the Condominium Management Consultant in order that all problems and recommended solutions are openly and confidentially discussed within the forum of a duly constituted Board meeting. It is critical that all decisions be rendered by the elected Board of Directors and that those decisions are implemented by the Management Company. The Board can delegate authority to the Management Company, however it cannot delegate any of its responsibilities under the Act. In summary, if Owners have any condominium problems, concerns, suggestions, inquiries or questions, they should contact the Management Company. If it is something that requires a Board decision, they will insist that Owners submit their concerns in writing, so the Board as a group can consider and act thereon. The Board, acting as a Board of Directors, will set the policy of the Corporation on matters affecting enforcement of its By-Laws and the control, management and administration of the real and personal property and the common property. Additionally the Board will direct the activities of the Management Company which will report directly to the elected Board of Directors. The Board members will exercise their statutory duties under the Condominium Property Act and will delegate said powers as they see fit by ordinary resolution of a quorum of Board members at a properly convened Board Meeting. The Board will be subject to the pleasure of the Owners of the Condominium Corporation, its By-Laws and the Act. It is an unwritten duty to “act fairly in the best interests of all Owners. This duty is referred to in legal terms as “Fiduciary Responsibility (loyalty and good faith)”. In general, as a Board member, you must act honestly in all matters, and even if a decision of your Board may have an adverse effect on you personally, but it is for the betterment of all Owners, your personal interests must not interfere with your decisions. It is important to note that all Board decisions are group decisions. Such decisions must be moved, seconded and voted upon by a quorum of the Board and the results of that vote clearly stated in the minutes. Therefore, any request that requires Board action must be in writing. Board members should not be phoned nor should any Owner knock upon their door requesting that they make some decision in the name of the Board. It’s important to protect the privacy of Board members and to allow the Board to function as it should – as a unified group. Once elected, the Board of Directors needs to nominate and elect Board members to the various Officers positions. The President of the Board is the Chairperson at Board meetings and Annual General Meetings. The President should work with all committees and give a general idea as to all work in progress with committees and contractors. To be effective in handling meetings, this person should always work from an agenda and hold all meetings in a business-like fashion, following parliamentary procedure. Wasted time at meetings is a sure way to dissuade enthusiastic Board members from attending more meetings. The Vice-President stands in for the President if the position is vacant and in many cases this person would move to fill the President’s position if elected in the following year. The Secretary is responsible to maintain the corporation’s records. This person does not necessarily need to be the person who records the minutes at meetings, but these documents are one of the most important segments of the Corporation’s records. The Treasurer is responsible for the financial transactions of the Corporation. This person may not be the person who does all the banking, but normally would be one of the authorized signing officers for banking transactions. It is most important for this person to understand how the corporate funds are managed. The quickest method to “get up to speed” as a new Treasurer is to give the financial report at each Board meeting. The above listed duties and responsibilities include summarized excerpts from a number of sources.